In a human rights forum held 21 years after the fall of communism in Poland, Falun Gong practitioners were invited to talk about the persecution of Falun Gong in China. At the forum held on June 4, 2010, the practitioners also told the attendees about the movement to quit the Chinese Communist Party (CCP) in China. Mr. Li Xiangchun spoke about how he was tortured by the CCP because of his practice of Falun Gong. Ms. Yi Rong from the Global Service Centre for Quitting the CCP talked about the movement to quit the CCP in China. The first elected president of Poland, Mr. Tadeusz Mazowiecki, listened to the practitioners. 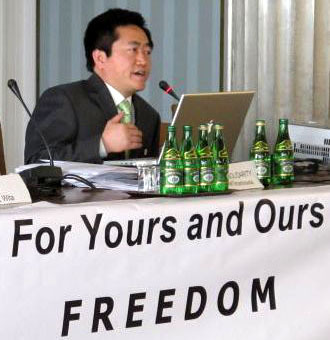 Mr. Li Xiangchun, a practitioner, was tortured for three years in a forced labour camp in China. He spoke from his own experience of the severe abuses and cruel torture used on Falun Gong practitioners. Since the CCP launched the persecution in 1999, 3383 practitioners are confirmed to have died as a direct result of that persecution. Ms. Yi Rong, Vice President of the Global Service Centre for Quitting the CCP, spoke to the audience about the spiritual awakening of the Chinese people. At the end of 2004, the Epoch Times launched a series of editorials, the Nine Commentaries on the Communist Party. Since then, more than 74 million people have quit the CCP and its affiliated organisations. Afterwards the practitioners explained the movement in detail to the first elected president of Poland, Mr. Tadeusz Mazowiecki. Practitioners from Poland Respectfully Wish Revered Master Happy New Year!